Update 1802 for Configuration Manager Technical Preview Branch – Available Now! | just another windows noob ? Update 1802 for Configuration Manager Technical Preview Branch – Available Now! Improvements to Windows 10 in-place upgrade task sequence – The default task sequence template for Windows 10 in-place upgrade now includes additional groups with recommended actions to add before and after the upgrade process. Deployment Template for Task Sequences – Using the Deployment wizard for Task Sequence you can now create a Deployment Template which can be saved and applied to an existing or new Task Sequence to create a TS deployment. Cloud management gateway support for Azure Resource Manager – When you deploy CMG with Azure Resource Manager, Azure AD is used to authenticate and create the cloud resources and does not require the classic Azure management certificate. Windows 10 in-place upgrade task sequence over the Internet – A Windows 10 in-place upgrade task sequence now works for clients via the Cloud Management Gateway and Cloud Distribution Point. Support for Windows 10 ARM64 devices – Starting in this release the Configuration Manager client is supported on Windows 10 ARM64 devices. Endpoint Protection workload transition in co-management – You can now transition the Endpoint Protection workload from Configuration Manager to Intune when co-management is enabled. Windows 10 Servicing for a specific collection report – This report displays general information about the Windows 10 servicing in the organization. Windows AutoPilot Device Information report – Now you can use this new report to collect device information that’s needed to create Windows AutoPilot deployment profile. Microsoft Edge browser policies – You can now set Microsoft Edge browser policies and control it in your enterprise. Report to show default browser for client machines – You can now run a report that shows the default browser for client machines. Improvements to Configuration Manager policies for Windows Device Exploit Guard – Additional policy settings for the Attack Surface Reduction and Controlled folder access components have been added for Windows Device Exploit Guard in Configuration Manager. Remote site server content library – You can now move the content library on your site server to a remote location. Phased Deployments – Phased deployments automate a coordinated, sequenced rollout of software without creating multiple deployments. Configure Windows 10 Delivery Optimization to use Configuration Manager boundary groups – Configure Delivery Optimization to leverage your boundary groups when sharing content among peers. Add management points to your boundary group fallback relationships – When a fallback relationship is defined, and a client fails to talk to the management point in current boundary group, it will fall back to the management point defined in the fallback boundary group. Product Lifecycle Dashboard – The dashboard shows the state of the Microsoft Product Lifecycle policy for Microsoft products installed on devices managed with Configuration Manager. Management insights – Management insights has a new look and feel in the 1802 Technical Preview, try it out! Update 1802 for Technical Preview Branch is available in the Configuration Manager Technical Preview console. For new installations please use the 1711 baseline version of Configuration Manager Technical Preview Branch available on TechNet Evaluation Center. Continue to use our UserVoice page to share and vote on ideas about new features in Configuration Manager. 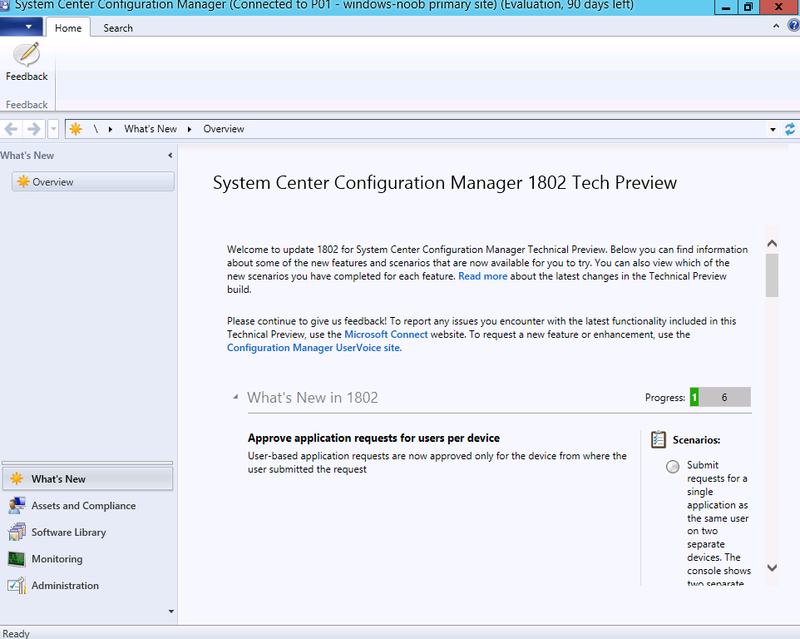 This entry was posted in 1802, System Center Configuration Manager Technical Preview. Bookmark the permalink.